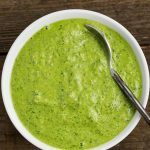 Lemony Green Pesto Sauce- you can make this yummy sauce in just 5 minutes using your food processor or blender. 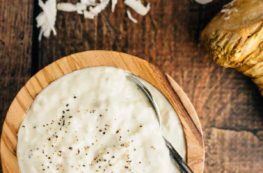 It goes great with pasta, as a dip, pizza sauce or dressing. It’s also oil-free! And this sauce is that easy. 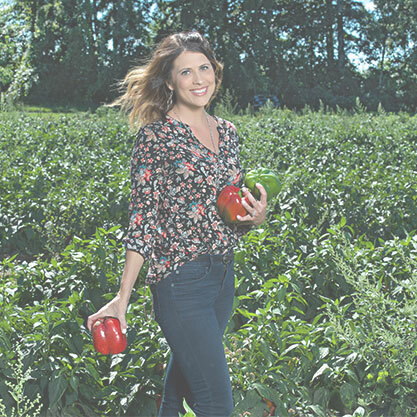 You can whip it up in 5 minutes using your blender or food processor and add it to pasta- or use as a dip, pizza sauce, or as a salad dressing. 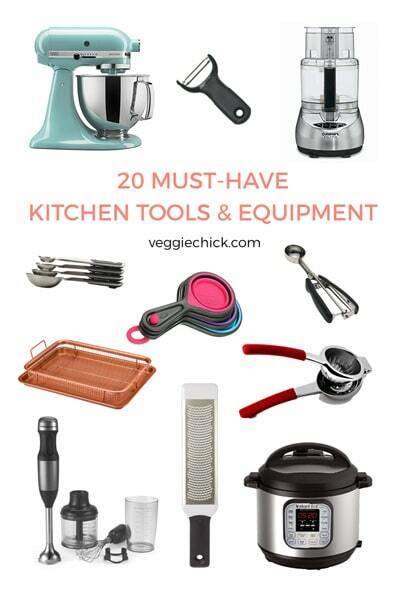 And my favorite part is- it’s oil-free and you won’t even miss it. 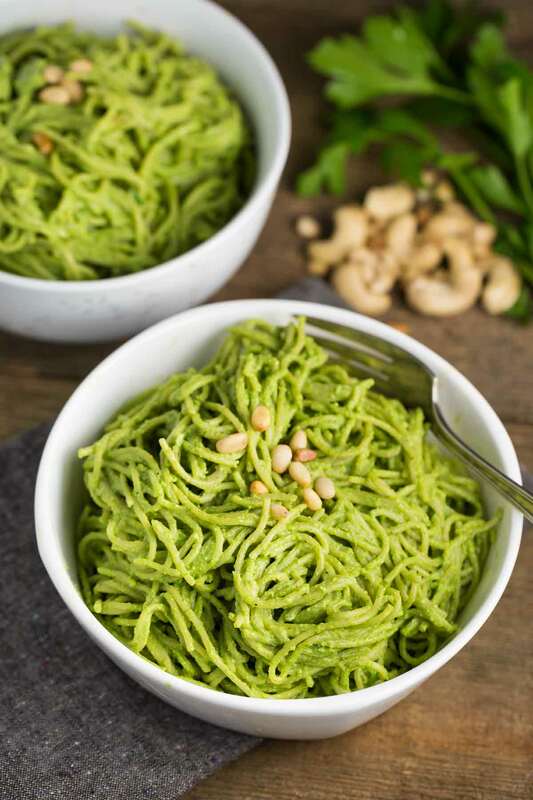 I might end up eating this Lemony Green Pesto Sauce on just about everything. It’s also super easy to sub out ingredients if you don’t have them. 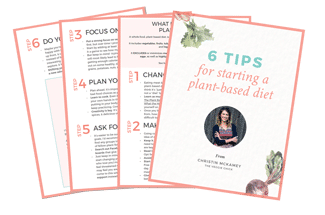 You can substitute spinach or kale for the arugula, or use basil instead of parsley. To make, in a food processor or high powered blender, add the raw cashews and pine nuts. Process until as fine as possible. You may need to stop it once or twice to scrape down the sides and blend again. Then, add the arugula, parsley, nutritional yeast, lemon juice, maple syrup, garlic, salt and pepper and 1/4 cup water. Then, blend until smooth. Note: some blenders may require a little more water to blend. Stir and add additional water if necessary until you get the consistency you want. But be sure to add water in very small increments as you may need less than you think. That’s it! 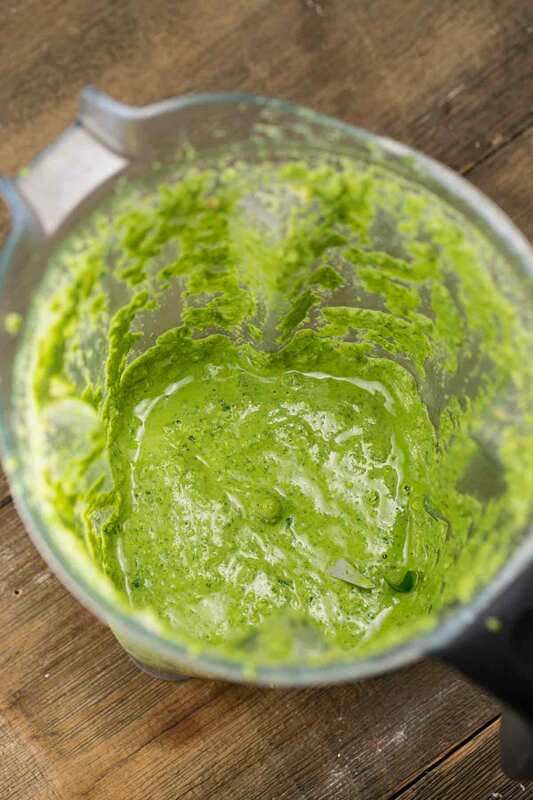 Mix this pesto sauce with pasta, use as a dip, pizza sauce, or add a little more water to make it a salad dressing. 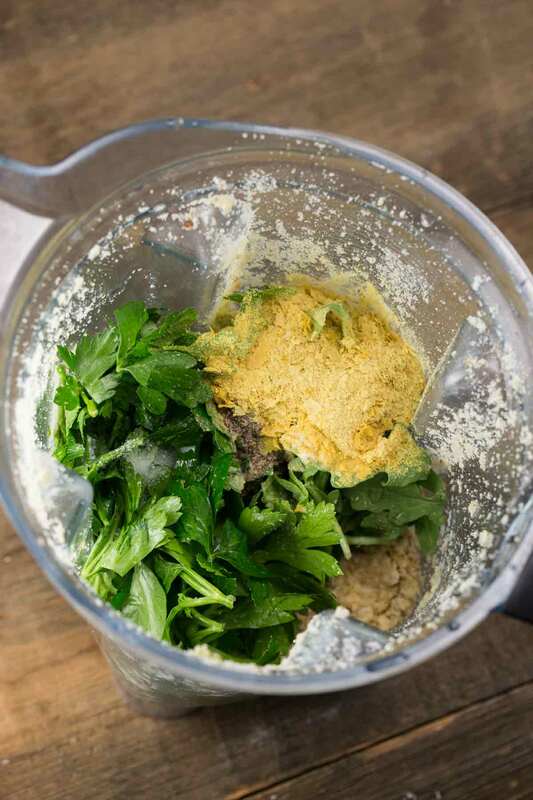 I’ve also used it on my Bagel Thin Pesto Sandwiches– yum! 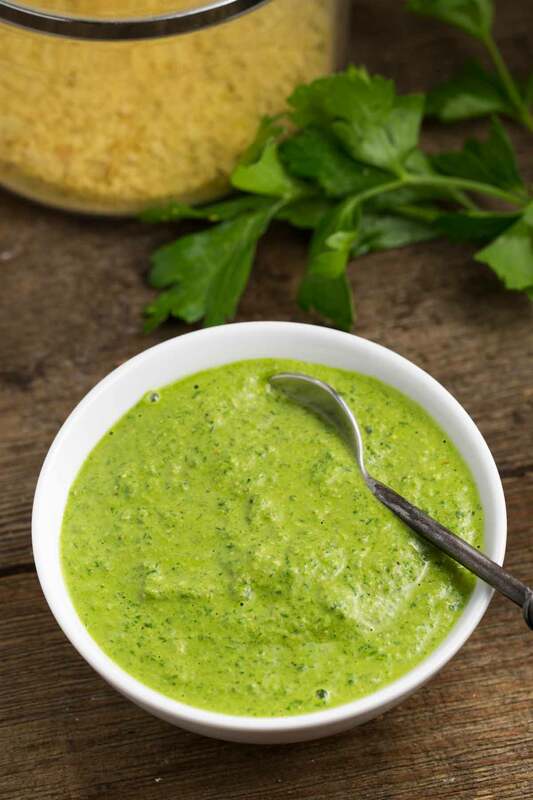 This recipe makes 1 cup pesto sauce. Each serving is about 1/4 cup sauce. Enjoy! 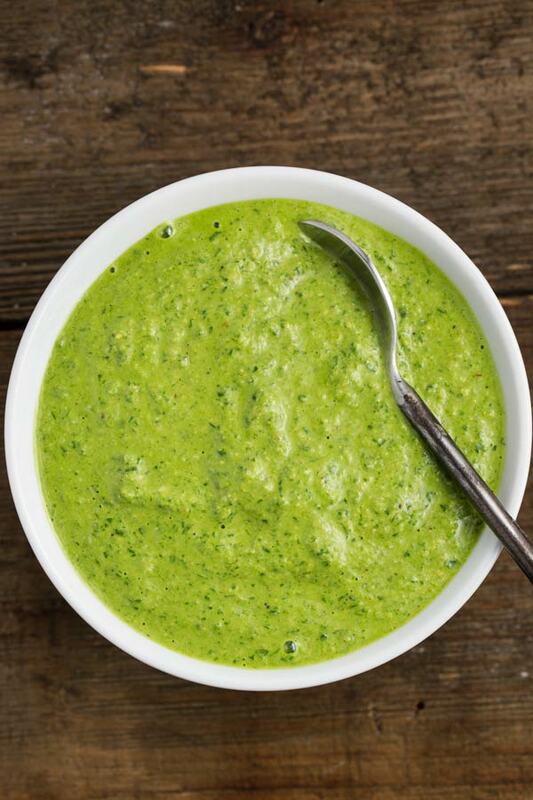 Make this yummy Lemony Green Pesto Sauce in 5 minutes using your food processor or blender. 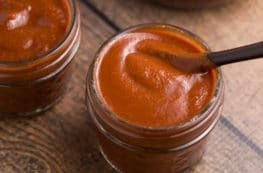 It goes great with pasta, as a dip, pizza sauce or dressing. It’s also oil-free! 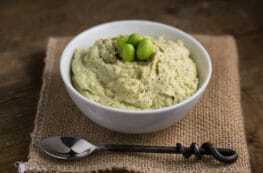 In a food processor or high powered blender, add raw cashews and pine nuts. Process until as fine as possible. Add arugula, parsley, nutritional yeast, lemon juice, maple syrup, garlic, salt and pepper and 1/4 cup water and blend until smooth. Some blenders may require a little more water to blend. Stir and add additional water (at 1 tablespoon increments) if necessary. Mix in with pasta, or use as a dip, pizza sauce or add a little more water to make it a dressing. This recipe makes 1 cup pesto sauce. The serving size is about 1/4 cup. So yummy…even without added oil or cheese!